Good morning! Thank you, Rosy, for your very kind introduction. But even more, thank you for your many years friendship. Back in Chicago, when I was just getting started in national politics, I reached out to a lot of people for advice and counsel, and Rosy was one of the very first. When I made my first visit to Israel, after entering the Senate, Rosy � you were at my side every step of that very meaningful journey through the Holy Land. And I want to thank you for your enduring friendship, your leadership and for your warm welcome today. Thank you to David Victor, Howard Kohr and all the Board of Directors. And let me say that it�s wonderful to look out and see so many great friends, including Alan Solow, Howard Green and a very large delegation from Chicago. I want to thank the members of Congress who are joining you today - who do so much to sustain the bonds between the United States and Israel - including Eric Cantor, Steny Hoyer, and the tireless leader I was proud to appoint as the new chair of the DNC, Debbie Wasserman Schultz. We’re joined by Israel’s representative to the United States, Ambassador Michael Oren. As well as one of my top advisers on Israel and the Middle East for the past four years, and who I know is going to be an outstanding ambassador to Israel-Dan Shapiro. Dan has always been a close and trusted adviser, and I know he’ll do a terrific job. And at a time when so many young people around the world are standing up and making their voices heard, I also want to acknowledge all the college students from across the country who are here today. No one has a greater stake in the outcome of events that are unfolding today than your generation, and it’s inspiring to see you devote your time and energy to help shape the future. Now, I’m not here to subject you to a long policy speech. I gave one on Thursday in which I said that the United States sees the historic changes sweeping the Middle East and North Africa as a moment of great challenge, but also a moment of opportunity for greater peace and security for the entire region, including the State of Israel. On Friday, I was joined at the White House by Prime Minister Netanyahu, and we reaffirmed that fundamental truth that has guided our presidents and prime ministers for more than 60 years-that, even while we may at times disagree, as friends sometimes will, the bonds between the United States and Israel are unbreakable, and the commitment of the United States to the security of Israel is ironclad. A strong and secure Israel is in the national security interest of United States not simply because we share strategic interests, although we do both seek a region where families and their children can live free from the threat of violence. It’s not simply because we face common dangers, although there can be no denying that terrorism and the spread of nuclear weapons are grave threats to both our nations. America’s commitment to Israel’s security also flows from a deeper place -and that’s the values we share. As two people who struggled to win our freedom against overwhelming odds, we understand that preserving the security for which our forefathers fought must be the work of every generation. As two vibrant democracies, we recognize that the liberties and freedom we cherish must be constantly nurtured. And as the nation that recognized the State of Israel moments after its independence, we have a profound commitment to its survival as a strong, secure homeland of the Jewish people. We also know how difficult that search for security can be, especially for a small nation like Israel in a tough neighborhood. I’ve seen it firsthand. When I touched my hand against the Western Wall and placed my prayer between its ancient stones, I thought of all the centuries that the children of Israel had longed to return to their ancient homeland. When I went to Sderot, I saw the daily struggle to survive in the eyes of an eight-year old boy who lost his leg to a Hamas rocket. And when I walked among the Hall of Names at Yad Vashem, I grasped the existential fear of Israelis when a modern dictator seeks nuclear weapons and threatens to wipe Israel off the map. Because we understand the challenges Israel faces, I and my administration have made the security of Israel a priority. It’s why we’ve increased cooperation between our militaries to unprecedented levels. It’s why we’re making our most advanced technologies available to our Israeli allies. And it’s why, despite tough fiscal times, we’ve increased foreign military financing to record levels. That includes additional support – beyond regular military aid – for the Iron Dome anti-rocket system. This is a powerful example of American-Israel cooperation which has already intercepted rockets from Gaza and helped saved innocent Israeli lives. So make no mistake, we will maintain Israel’s qualitative military edge. Its illicit nuclear program is just one challenge that Iran poses. As I said on Thursday, the Iranian government has shown its hypocrisy by claiming to support the rights of protesters while treating its own people with brutality. Moreover, Iran continues to support terrorism across the region, including providing weapons and funds to terrorist organizations. So we will continue to work to prevent these actions, and will stand up to groups like Hezbollah who exercise political assassination, and seek to impose their will through rockets and car bombs. So when the Durban Review Conference advanced anti-Israel sentiment, we withdrew. In the wake of the Goldstone Report, we stood up strongly for Israel’s right to defend itself. When an effort was made to insert the United Nations into matters that should be resolved through direct negotiations between Israelis and Palestinians, we vetoed it. And so, in both word and deed, we have been unwavering in our support of Israel’s security. And it is precisely because of our commitment to Israel’s long-term security that we have worked to advance peace between Israelis and Palestinians. Now, I have said repeatedly that core issues can only be negotiated in direct talks between the parties. And I indicated on Thursday that the recent agreement between Fatah and Hamas poses an enormous obstacle to peace. No country can be expected to negotiate with a terrorist organization sworn to its destruction. We will continue to demand that Hamas accept the basic responsibilities of peace: recognizing Israel’s right to exist, rejecting violence, and adhering to all existing agreements. And we once again call on Hamas to release Gilad Shalit, who has been kept from his family for five long years. And yet, no matter how hard it may be to start meaningful negotiations under the current circumstances, we must acknowledge that a failure to try is not an option. The status quo is unsustainable. 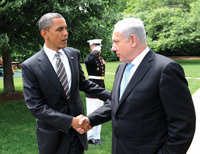 That is why, on Thursday, I stated publicly the principles that the United States believes can provide a foundation for negotiations toward an agreement to end the conflict and all claims – the broad outlines of which have been known for many years, and have been the template for discussions between the United States, Israelis, and Palestinians since at least the Clinton Administration. I know that stating these principles – on the issues of territory and security – generated some controversy over the past few days. I was not entirely surprised. I know very well that the easy thing to do, particularly for a President preparing for reelection, is to avoid any controversy. But as I said to Prime Minister Netanyahu, I believe that the current situation in the Middle East does not allow for procrastination. I also believe that real friends talk openly and honestly with one another. And so I want to share with you some of what I said to the Prime Minister. Here are the facts we all must confront. First, the number of Palestinians living west of the Jordan River is growing rapidly and fundamentally reshaping the demographic realities of both Israel and the Palestinian territories. This will make it harder and harder – without a peace deal – to maintain Israel as both a Jewish state and a democratic state. And third, a new generation of Arabs is reshaping the region. A just and lasting peace can no longer be forged with one or two Arab leaders. Going forward, millions of Arab citizens have to see that peace is possible for that peace to be sustained. Just as the context has changed in the Middle East, so too has it been changing in the international community over the last several years. There is a reason why the Palestinians are pursuing their interests at the United Nations. They recognize that there is an impatience with the peace process – or the absence of one. Not just in the Arab World, but in Latin America, in Europe, and in Asia. That impatience is growing, and is already manifesting itself in capitols around the world. These are the facts. I firmly believe, and repeated on Thursday, that peace cannot be imposed on the parties to the conflict. No vote at the United Nations will ever create an independent Palestinian state. And the United States will stand up against efforts to single Israel out at the UN or in any international forum. Because Israel’s legitimacy is not a matter for debate. But the march to isolate Israel internationally – and the impulse of the Palestinians to abandon negotiations – will continue to gain momentum in the absence of a credible peace process and alternative. For us to have leverage with the Palestinians, with the Arab States, and with the international community, the basis for negotiations has to hold out the prospect of success. So, in advance of a five day trip to Europe in which the Middle East will be a topic of acute interest, I chose to speak about what peace will require. There was nothing particularly original in my proposal; this basic framework for negotiations has long been the basis for discussions among the parties, including previous U.S. Administrations. But since questions have been raised, let me repeat what I actually said on Thursday. I said that the United States believes that negotiations should result in two states, with permanent Palestinian borders with Israel, Jordan, and Egypt, and permanent Israeli borders with Palestine. The borders of Israel and Palestine should be based on the 1967 lines with mutually agreed swaps, so that secure and recognized borders are established for both states. The Palestinian people must have the right to govern themselves, and reach their potential, in a sovereign and contiguous state. That is what I said. Now, it was my reference to the 1967 lines with mutually agreed swaps that received the lion’s share of the attention. And since my position has been misrepresented several times, let me reaffirm what “1967 lines with mutually agreed swaps” means. By definition, it means that the parties themselves – Israelis and Palestinians – will negotiate a border that is different than the one that existed on June 4, 1967. It is a well known formula to all who have worked on this issue for a generation. It allows the parties themselves to account for the changes that have taken place over the last forty-four years, including the new demographic realities on the ground and the needs of both sides. The ultimate goal is two states for two peoples. Israel as a Jewish state and the homeland for the Jewish people, and the state of Palestine as the homeland for the Palestinian people; each state enjoying self-determination, mutual recognition, and peace. If there’s a controversy, then, it’s not based in substance. What I did on Thursday was to say publicly what has long been acknowledged privately. I have done so because we cannot afford to wait another decade, or another two decades, or another three decades, to achieve peace. The world is moving too fast. The extraordinary challenges facing Israel would only grow. Delay will undermine Israel’s security and the peace that the Israeli people deserve. I know that some of you will disagree with this assessment. I respect that. And as fellow Americans and friends of Israel, I know that we can have this discussion. Ultimately, however, it is the right and responsibility of the Israeli government to make the hard choices that are necessary to protect a Jewish and democratic state for which so many generations have sacrificed. And as a friend of Israel, I am committed to doing our part to see that this goal is realized, while calling not just on Israel, but on the Palestinians, the Arab States, and the international community to join us in that effort. Because the burden of making hard choices must not be Israel’s alone. Even as we do all that’s necessary to ensure Israel’s security; even as we are clear-eyed about the difficult challenges before us; and even as we pledge to stand by Israel through whatever tough days lie ahead – I hope we do not give up on that vision of peace. For if history teaches us anything-if the story of Israel teaches us anything-it is that with courage and resolve, progress is possible. Peace is possible. For so long as there are those, across the Middle East and beyond, who are standing up for the legitimate rights and freedoms which have been denied by their governments, the United States will never abandon our support for those rights that are universal. And so long as there are those who long for a better future, we will never abandon our pursuit of a just and lasting peace that ends this conflict with two states living side by side in peace and security. This is not idealism or naivete. It’s a hard-headed recognition that a genuine peace is the only path that will ultimately provide for a peaceful Palestine as the homeland of the Palestinian people and a Jewish state of Israel as the homeland of the Jewish people. Thank you. God bless you. God bless Israel, and God bless the United States of America.